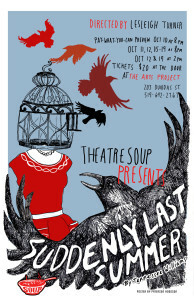 Suddenly Last Summer is a play dripping with the heat of a New Orleans drama. An aging Southern belle, now a grande dame accustomed to having her way, Mrs. Venable is convinced that her niece Catherine is telling wild tales about the death of Mrs. Venable’s son, Sebastian. The mother enshrines him in memory as a poet, paragon, prince. Catherine’s story of Sebastian’s horrible death one white-hot afternoon last summer on an exotic beach in Europe surely proves the girl insane… or does it? Tickets: $20; available online, at The ARTS Project box office, 519-642-2767, and at the door.